After a family receives a chilling chain letter on Halloween, strange things begin to happen that force them to confront not only their own nightmares, but their feelings for each other. The topical approach to Halloween is costumes and candy. Research has unncovered the traditions and numerous rituals that have evolved with the ancient holiday spanning the globe. What's new to me, is the act of being Boo'd. Perhaps because my family was never big on Halloween, much like the fragmented Detroit, Michigan family in this 91 minute bluesy treat. 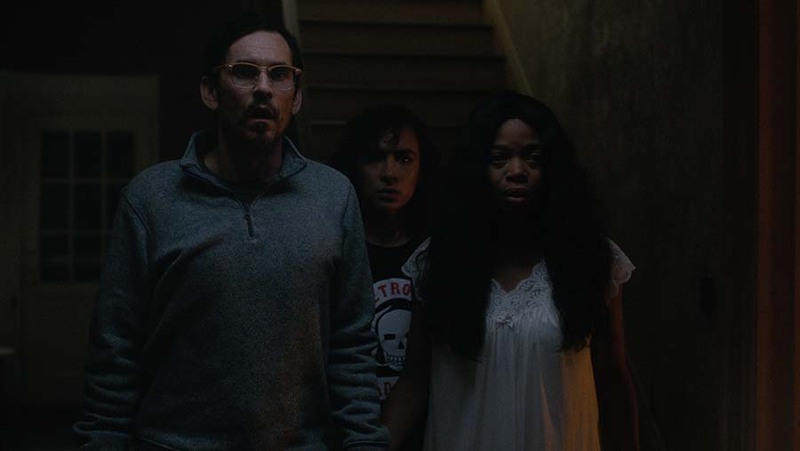 Shading the rhyme in a more sinister color, writer/director and Detroit native himself Luke Jaden uses the act of "Boo Your Neighbors" to traverse the supernatural's intimate relationship to the stormy reality of four people living under the same roof. Patriarch James (Rob Zabrecky) with a full dependency on Jesus Christ and a gentle sterness rejects the Boo!, forsaking the fear in his son Caleb's (Jaden Piner) belief in the superstition. His mother Elyse (Ash vs. Evil Dead's Jill Marie Jones) conveys deflection and sadness while attempting to be the dutiful, play-it-safe wife. But her thin, teetering performance is only aggravated by her daughter Morgan's (Aurora Perrineau) recalcitrance. As the two siblings find separate ways of escapism (Morgan's thirst for travel with boyfriend Ashton and Caleb's disturbing artwork and goldfish) their parents reveal the lifers, generational divide. James and Elyse wallow in the loss of a spark; in their marrage and personal optimism while walking the city that Jaden carefully conceals in shadow with visuals that very well match the film's tone. What being Boo'd does on this pagan day, James asserts is bring all of this searching and discomfort to a very satisfying twist that'll make audiences reflect on these traditions/rituals that Jaden cleverly intertwines with personal turmoil. BOO! embraces the darkness with a slick attitude of familiarity and boldness. It's a cruise-paced narrative that dissects the all too common familial conflicts that are ever-ripe for the genre to unpack. Shot tremendously in moody, golden and blue hues with a cunning soundtrack to match, BOO! lives up to the many interpretations of its title without ever being cheap or feeling forced. Much of what will gaurantee to chill you are the human elements that the strange and spooky are constantly poking to find a breach. The performances are undoubtedly strong, especially from Piner as Caleb, who was last seen in 2016's revelation, Moonlight. BOO! promises a raw, solemn, exquisite journey into nightmares that will assuredly haunt audiences at less of a moments notice. BOO! is having its world premiere at the Brooklyn Horror Film Festival Sunday, October 14th, 3:40PM at the Wythe Hotel Cinema (80 Wythe Ave).